Metal, plastic, adjustable glass mirror. Multi-Mirror reflector with protective glass cover. Complete with bulb. Lamp with white shade Teflon. Models of insects made ​​by hand. Cm height. 25. 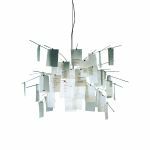 Manoman by Ingo Maurer is a suspension lamp made ​​of wood and glass designed by Ingo Maurer and his team on the inspiration of the artist Man Ray. Ingo Maurer - Wo bist du, Edison...? Eddie's Son can not be connected directly to the output of the current ceiling. Direct exposure to sunlight and nicotine can reduce the length of the hologram. 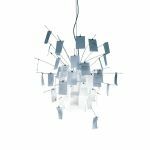 Born of the creative genius of Ingo Maurer Zettel z is a dramatic pendant lamp consists of dozens of Chinese paper, on which are written beautiful love phrases in all languages. Tin can, aluminium, stainless steel, plastic. 230/125 volts. Max. 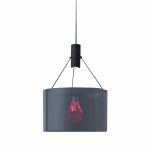 60 watts halogen, base G9.The can, 13,5 x 8,5 cm, containing lightbulb, reflector, socket, cable and switch, turns into a hanging or wall lamp. Ten original Campari Soda bottles, individually detachable. Plastic, metal. Height freely adjustable via Campari bottle cap. 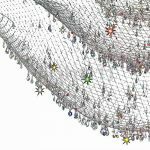 Transparent canopy, Ø 13 cm. For ceiling heights up to 300 cm. Stainless steel, aluminium reflector with protective glass cover, coaxial cable. Complete with bulb. Polished chromium-plated metal base, hand-blown crystal glass. Complete with top-chromated bulb. Stainless steel, aluminum, plastic, glass. 230/125 volts. 250 watt halogen, E27 base, glass. 230 volts: Continuously variable dimmer with sensor switch. 125 Volt: stepless dimming of the light intensity by lineare.Varialuce and cable, transparent. 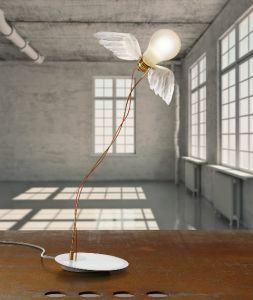 Metal, goose-feather wings, ten low-voltage bulbs, transparent cables. Complete with bulbs plus 2 spares. Birdie’s Nest is designed for rooms with lower ceilings. Not suited for rooms with high humidity. Heat-resistant glass fabric. Capable of withstanding continuous use at temperatures of up to 180°C. Cloth size 75 x 75 cm. Bulb not included. Translucent white cardboard, ceiling Ø. 9 white plastic, fluorescent clip. Height adjustable. Size and shape of the lampshade variables. Bulb not included. Metal and plastic. The top half of the flexible shaft allows variable adjustment of the reflector. 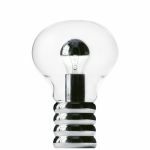 Reflector rotates 360 degrees around the bulb. Continuously variable dimmer. 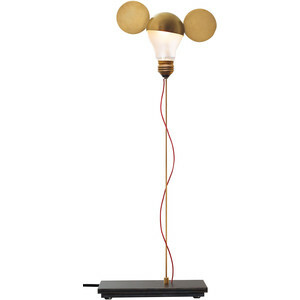 Complete with lamp. Charter painted gold or silver aluminum. Charter painted gold, silver or white. Suspension with braided polyester threads. For ceilings with a height from 230 cm. Max 200 watt halogen R7s. Bulb included. Translucent white cardboard, ceiling Ø. 9 white plastic, fluorescent clip. Height adjustable. Size and shape of the lampshade variables. Available with fluorescent light pink or orange.